Shortly after my wedding just a couple months ago, a relative dropped off a box of personal photos collected by my grandmother who passed away three years ago. Not all photos were found with labels, and over time faces and places were forgotten. Some of the 1000 images go back to at least 1930. Below is a slideshow featuring just a fraction of the images I digitally scanned over a week’s time. Catherine Taylor (born Catherine Euphemia Graham) was the child of Canadian missionaries who owned a home in Jasper, Ontario. 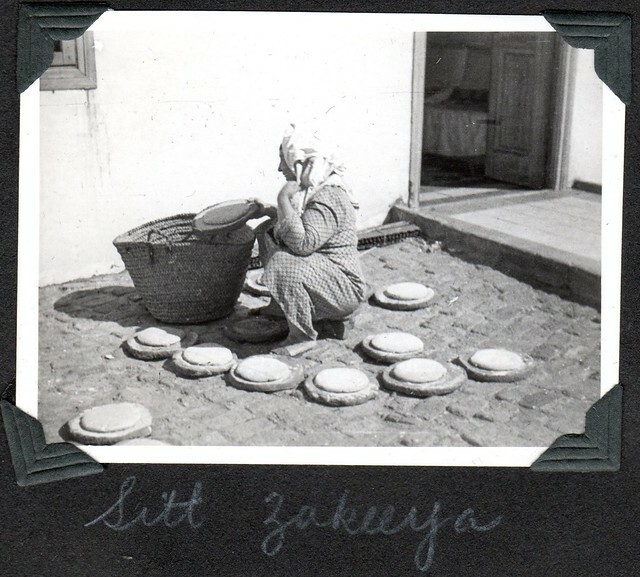 She also lived in Egypt for a lengthy period of time during childhood–long enough to learn Arabic and get sick of the Pyramids, she recalled–and again doing her own missionary work as an adult. She also traveled Europe and the Middle East shortly after World War II. 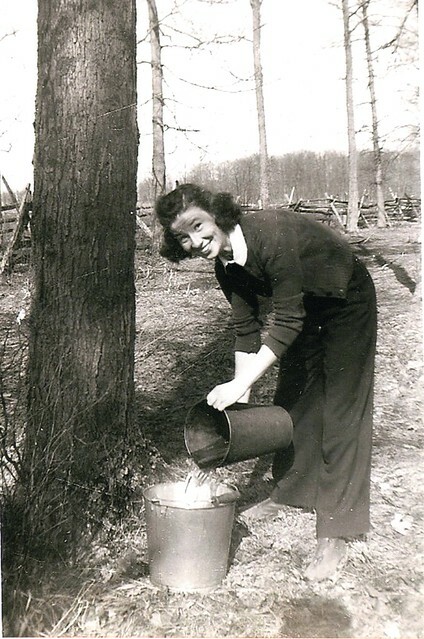 With training as a nurse and a schoolteacher, she eventually settled down on a farm in Cardinal, Ontario with my grandfather Charles. The collection is a fascinating look at a world that looks vaguely familiar to today, but not quite. Nations like Palestine, Transjordan, and West Germany don’t exist in the same way anymore. But then again, neither does Canada. . . .
Jennifer and I were married on Saturday. 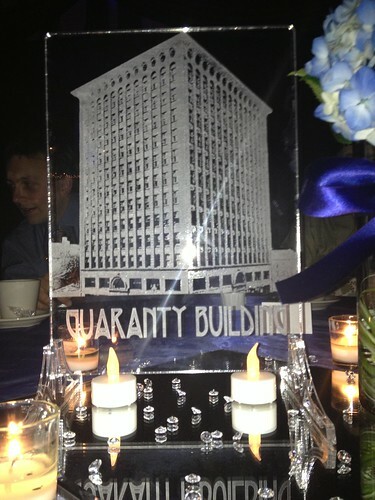 Photos may come later but I wanted to post some images of the centerpieces. They are custom laser etchings designed and produced by Sean Nowicki of BFLOMADE, with Jennifer’s input. Sean recently put up an Etsy page so people can contact him directly. Our centerpieces were a bit large but he can create 2-D and 3-D etchings of most anything in different sizes. Is This the Most Architecturally Significant Building in Buffalo? The century-old Delaware Court is an elegant, unobtrusive building on the Chippewa Strip. The events that took place inside, however, changed the city forever. For decades, Delaware Court was a mecca for Buffalo’s most important architects as they built Buffalo’s most important buildings. Delaware Court was designed by architects Lansing, Bley & Lyman and opened in 1917. Lawrence Bley hailed from nearby Hamburg, while Duane Lyman, once declared the “Dean of Western New York Architecture,” was originally from Lockport. Williams Lansing worked previously as a draftsman for the prolific Green & Wicks firm, then partnered with Green & Wicks draftsman Max Beierl to build landmarks such as the Connecticut Street Armory and St. Francis Xavier Church (now the Buffalo Religious Arts Center). Lansing, Bley & Lyman worked together for less than ten years and Delaware Court is one of their few remaining commissions. Still, they created some notable buildings, including the current President’s House for Buffalo State College on Lincoln Parkway. Lansing left the firm in 1919 to partner with Chester Oakley, but Lansing died a year later. Oakley continued until his own death in 1968, best known for a trinity of ornate Catholic Churches: St. John the Baptist, Blessed Trinity, and St. Casimir’s. 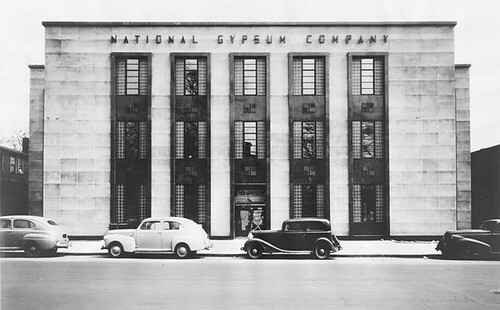 Bley & Lyman worked together for another two decades, designing the Saturn Club, building 800 West Ferry for Darwin R. Martin, and partnering with EB Green for what is now the Old Federal Courthouse on Niagara Square. 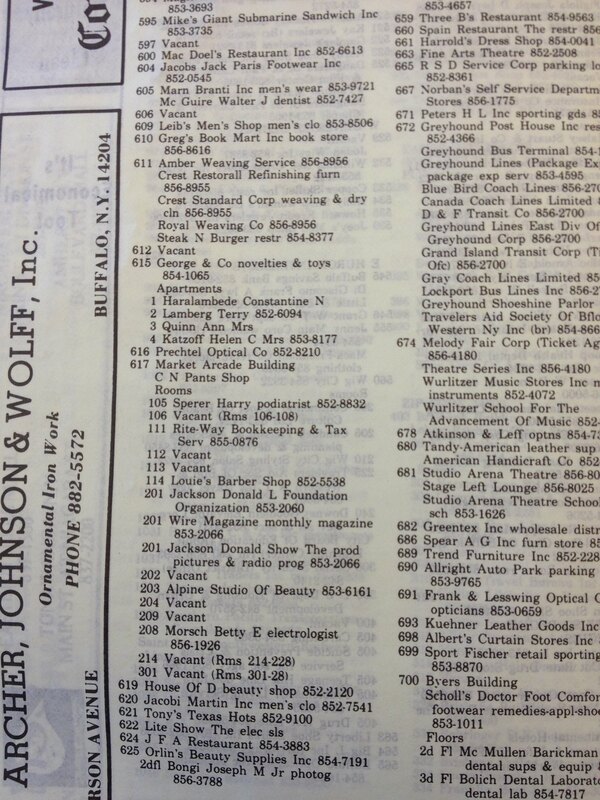 When Bley died in 1939, Lyman carried on as Lyman & Associates until his passing in 1966. 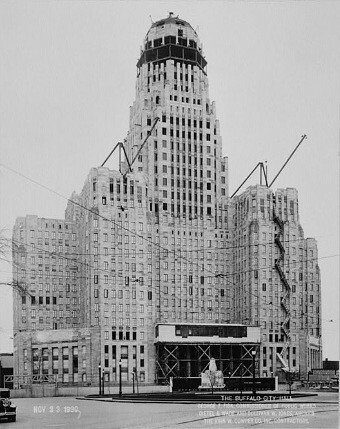 That firm supervised the addition to the Liberty Building, Minuro Yamasaki’s One M&T Plaza, and several buildings on the University of Buffalo’s South Campus. Like many later architects they used the Delaware Court location as a springboard for bigger and bigger opportunities. Delaware Court immediately attracted other architects as tenants. In 1917 architect William A. Kidd moved in with partner and brother Franklyn J. Kidd, where they remained until 1922. Their most well-known work from that period is probably the Rand House on Delaware Avenue’s “Millionaire’s Row.” Today the mansion is home to Canisius High School. Later, Kidd & Kidd would also design the Rand Building on Lafayette Square and assist Eliel & Eero Saarinen on the world-famous Kleinhans Music Hall on Symphony Circle. After World War I, Delaware Court became a hive of activity. Buffalo’s booming population required the city to set aside $8 million for construction of not one but eighteen new public schools. 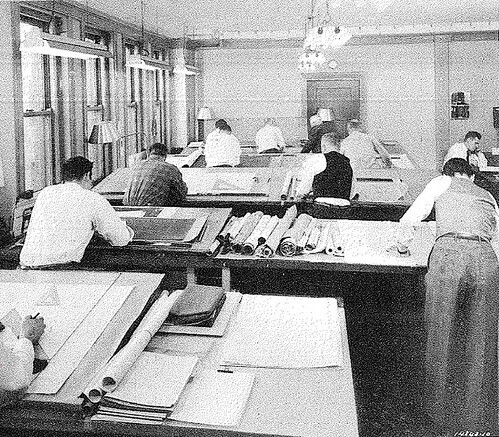 Rather than compete for eighteen separate commissions, thirty-five architectural firms banded together to form Associated Buffalo Architects, Inc. and opened an office in Room 40 of Delaware Court. Individual firms would be given buildings but recognition would go to the ABA. 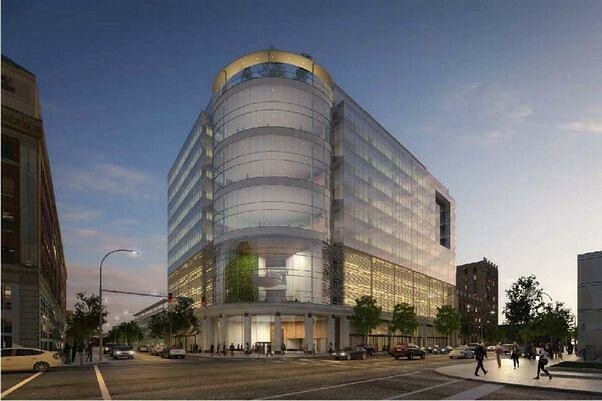 Contracting directly with the Buffalo Board of Education, the entire project was put under the auspices of an internally chosen board of local architects. 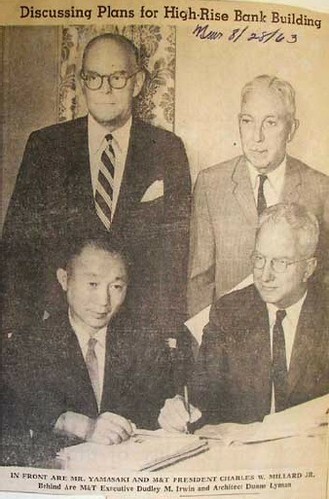 Duane Lyman was appointed Secretary. A rendering of Intermediate School #11 by the Association of Buffalo Architects, designed by George Cary and located at Doat Street and Poplar Avenue. Cary was on the Board of Architects for the Pan-American Exposition of 1901 and designed the Buffalo History Museum. “It will no doubt come as a shock . . . to learn that fifty architects in the city of Buffalo consented to have seven of their number pass judgement on their professional qualifications,” noted the Journal of the American Institute of Architects. The Engineering News Record called the association “A very striking example of disinterested service to the public by a group of professional men–the most striking we can recall in the construction professions.” Contractors could still bid on specific construction projects through the BoE, but blueprints and other plans were only available through the Delaware Court office. A rendering of Intermediate School #2 by the Association of Buffalo Architects, designed by Esenwein & Johnson (closed in 1961 and later demolished). Esenwein & Johnson are best known for the Electric Tower, the Calumet Building, and Lafayette High School. Even more notable, the association brought in the nationally renowned William B. Ittner of St. Louis as Consulting Architect for all school designs. Ittner promoted a general “E” formation of central schools throughout the country, using distanced wings for subject-specific classrooms and labs and a middle third wing for gymnasium, auditorium, and cafeteria use. 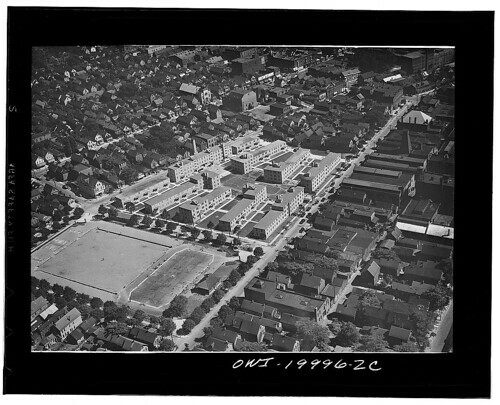 If you attended a school built between World War I and World War II you were probably in some version of an “E” plan school, and the man who popularized it worked out of Delaware Court. This format was used in cities as well as rural schools, as the era of one-room schoolhouses subsided in favor of central school districts around this time. Ittner’s push for orderly and efficient school plants was promoted in earnest with the aid of the Department of the Interior. The “E” type is probably the most ubiquitous public architecture in American history. 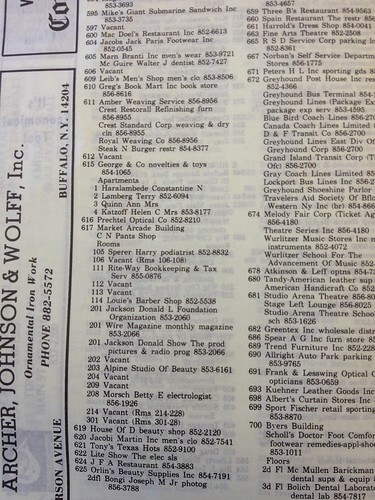 ABA no longer exists, but Ittner’s firm established in 1899 still creates schools. Like Duane Lyman, Frederick C. Backus was a veteran of World War I; he worked as a draftsman for Bley & Lyman for a time. At one point Backus was also Buffalo’s City Architect before striking out on his own, and the City Architect’s office is where he found draftsman Donald Love. Backus originally hired David Crane, who worked in EB Green’s office, as his personal draftsman in 1936 but elevated him to partner. 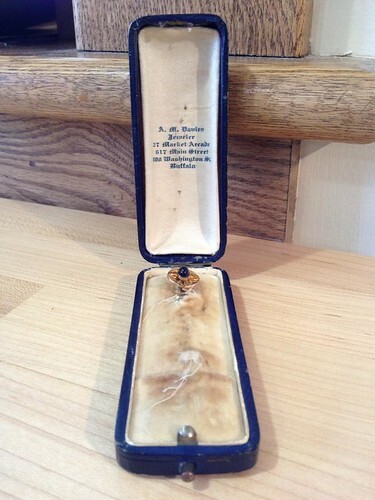 Love would take leave during World War II but would return after being wounded in battle. Backus, Crane & Love remained in Delaware Court into the 1960s and were trailblazers for Buffalo’s modernist, post-war construction period. They designed major projects including Erie County’s Rath Building, the Marine Drive Apartments, and the National Gypsum Company Building. Backus, Crane & Love’s most historic accomplishment–like the Delaware Court building where it was conceived–is under threat of demolition. The Willert Park Courts, the first public housing open to African-Americans in Buffalo, began construction in 1939. A WPA project, the first phase consisted of 172 apartments. For years it was the only public housing for the city’s African-Americans, and it remains a cultural landmark for generations of residents to this day. Walls and private entrances still exhibit unique sculptures by Depression-era artists Robert Cronbach and Harold Ambellan. In 1940, the Museum of Modern Art in New York City published a Guide to Modern Architecture featuring the most vital modern buildings of the 20th century. MoMA highlighted Willert Park alongside Louis Sullivan & Dankmar Adler’s Guaranty Building and commissions by Frank Lloyd Wright as Buffalo’s best examples of modern design. Delaware Court’s convenient location for networking, its large windows able to flood sunlight onto drafting tables, and an attractive, classically designed facade (as if to advertise “Professional Architects Inside”) are all reasons why it became a mecca for Buffalo architects. Recent hotel development plans for the property involve complete demolition of the building and the removal of all tenants. New construction, however, would mimic the curved corner entrance. Developers have hinted as preserving pieces of terra cotta decoration but those plans appear tenuous at best. Toronto’s Allen Lambert Galleria in Brookfield Place comes immediately to mind as an example of how older buildings can be woven into new construction if an inspired architect is involved. One wonders what a Duane Lyman, John Wade, or Frederick Backus would design for the property if they were alive today. . . . Proposed new building for Delaware Court Site. Image from Buffalo Rising. Thanks to Jennifer Walkowski for some of the information in this post. 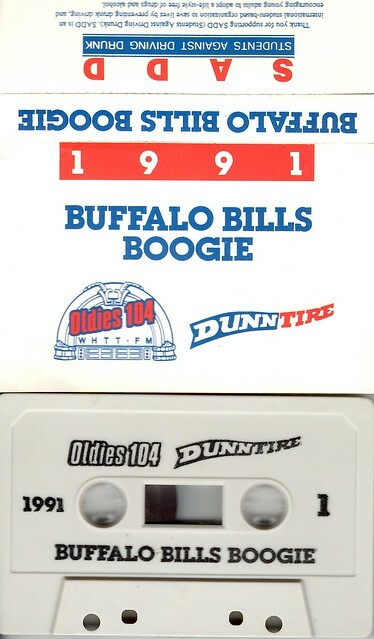 Recently I rediscovered my old Buffalo Bills Boogie cassettes, song parodies played the week before each Bills game on oldies station 104.1 WHTT-FM. Here are the songs I have; maybe you can help me find more. Coincidentally, one track is “You’ve Lost that Winning Feeling” from the 1993 season opener versus the New England Patriots. (The Bills won at home, 38-14). Cassette cover from the 1992 edition. Tapes and CDs were sold at Dunn Tire locations and supported local charities. For anyone meeting up with friends before kickoff, you can turn these tapes into a game. For example, take a drink anytime a player is mentioned who is in the Hall of Fame. Take another drink whenever the singer references “Oldies 104” and personalities like Danny Neaverth. Also below are the final scores of each game and what song is parodied (except for one I just can’t recall). 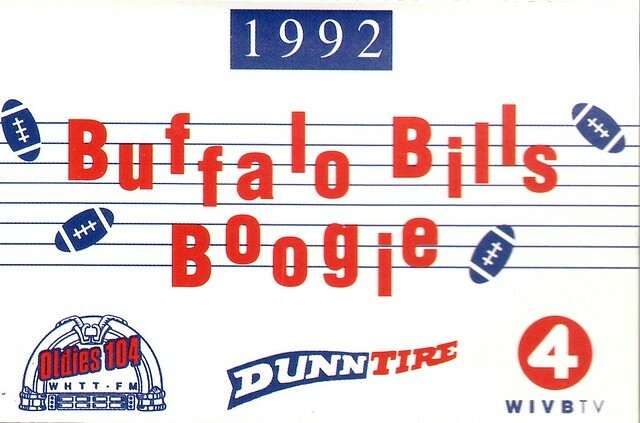 Unless that team relocated or did not exist twenty years ago you will find a song for each team Buffalo will play in 2013. 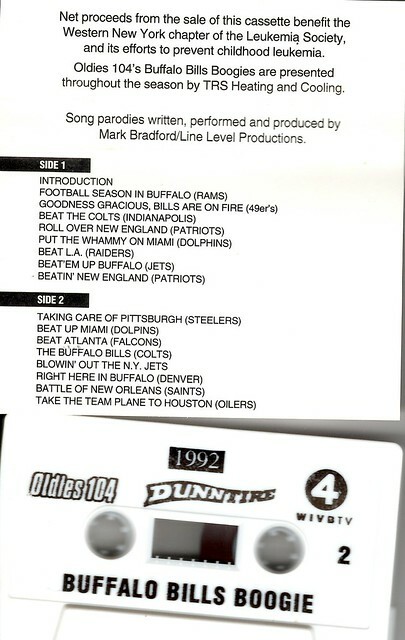 I only own tapes from 1991 and 1992, the Bills’ second and third Super Bowl years. Someone named Matt Mavi uploaded the years I have to YouTube in addition to the 1993 song above. (Thanks!) Another blogger named Tim Minneci posted earlier files dubbed right from radio broadcasts. Once I read there were recordings made from 1988 through 1994 but I can’t confirm it. If you know anything about these or other parodies, please leave a comment! The closest modern equivalent to these songs would have to be the weekly Let’s Go Bills Rap. Parody of “Great Balls of Fire” by Jerry Lee Lewis; Won 34-31. Fun fact: The first game in NFL history without a punt by either team. Parody of “Last Train to Clarksville” by The Monkees; Lost 27-3. Fun Fact: Backup quarterback Frank Reich would take over for an injured Jim Kelly. The Bills would play the Oilers one week later in what simply became known as “The Comeback,” winning 41-38 in overtime. 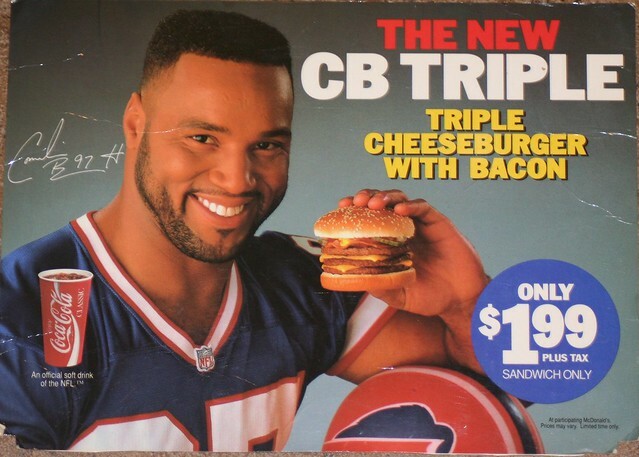 Linebacker Cornelius Bennett had a forced fumble, sack, and a touchdown on a Monday night game against the Dolphins in 1991, so McDonald’s created a sandwich. Click the photo for more info. The Oldest Building in Erie County . . . is Moving? 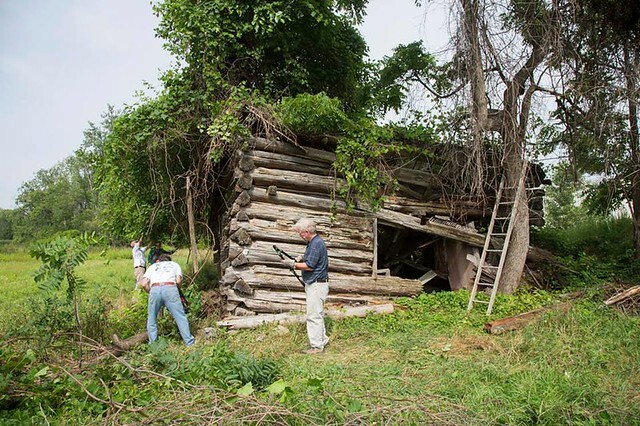 Sometime this September, a 200-year-old log cabin will be picked up and transported four miles to a “new” historic site. This structure represents the very earliest history of organized settlement in Western New York. Asa (or Amos, depending on the source) and James Woodward bought this plot of land directly from the Holland Land Company in November 1803 (Lot 6. Section 12 of Town 11 in Range 6 to be precise). A year would pass before Warren Hull bought the property where the cabin will soon move. 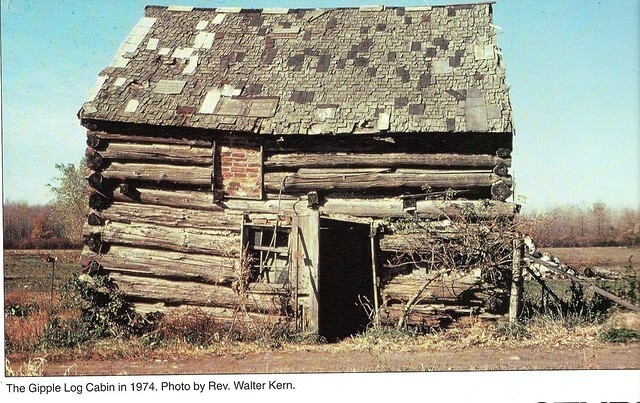 Some refer to the Gipple Log Cabin as the Bowman-Gipple Cabin. Benjamin Bowman was another early settler and a mill operator; the hamlet of Bowmansville in Lancaster is named after him as well. Like many frontier settlers such a cabin would be a “starter home” that could be assembled quickly before the first winter set in. Subsequent years of land-clearing would allow families to add additions or build more permanent homes. The Gipple family, while not the original landowners and who probably did not use the cabin as a residence, probably lived on this land the longest. A cursory look at census records shows Clement Gipple owning the farm as early as 1910. Clement’s mother Ella was a Bowman. His son Russell remained on the land as an adult; both men passed away in the 1970s. Russell Gipple c.1917 and c.1949. Sister Edith and wife Hazel are also pictured. All images from Ancestry.com. A couple years ago I went out with a camera to get a better look. The Gipple Cabin can be found at the southwest corner of the intersection of Harris Hill Road and Wehrle Drive in Lancaster. It now exists at the very corner of an expanding office development whose parking lot ends only a few yards from the front door. What is left of the building has been threatened with demolition several times in the past few years. According to locals, previous efforts to manage or restore the former home–even to visit it–were prevented by owners. Exploring the 1803 Gipple Log Cabin from Jafafa Hots on Vimeo. More photos here. Of course there are serious questions about the ability to move such a compromised structure, harming the building’s historicity through relocation, and even why the land should be given up for suburban sprawl. Considering its ragged state, however, moving the Gipple Cabin to a place where it can be safely appreciated by the general public is a whole lot better than the inevitable alternative. 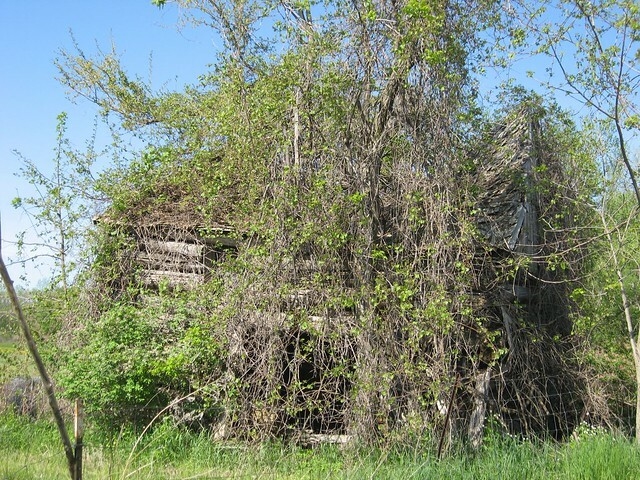 Perhaps it will be moved and kept at its current state; perhaps it will be restored and become a visitor draw like the c.1820 Goodrich-Landow Log Cabin at the Clarence Historical Society. To keep up to date with developments, please visit the Hull Family Home’s Facebook page. Hull House volunteers clear debris to access the Gipple Cabin. Below are some other photos I posted on the former Buffalo Tours blog in 2009. You can see the cabin predates Bowman’s 1808 saw mill by the axe-cut logs. The no-nails construction is original but the many alterations–some haphazard–to repair walls and supports extend over the centuries. Window and stovepipe holes can be found, temporary roof patches dangle from the ceiling, and vegetation hides the rest. 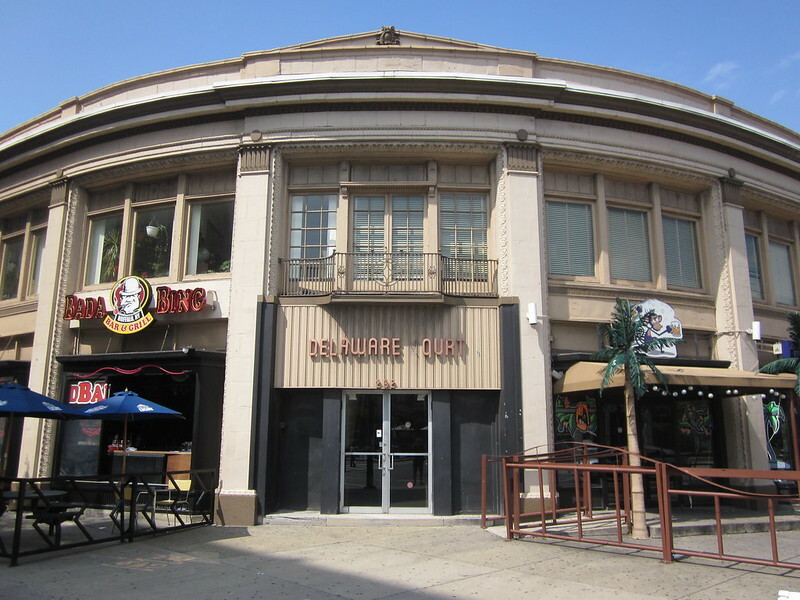 Note: With news that the Market Arcade is for sale by the City of Buffalo, I thought it a good time to post this article I originally published in the now-defunct Buffalo Downtowner. One of the feature buildings in downtown Buffalo is probably better known to vacationers than Buffalo natives. The Market Arcade at 617 Main Street is home to Visit Buffalo Niagara and its Visitor Center. Overshadowed by Shea’s and other gems in the historic Theater District, it is just as historic and architecturally significant. * The stories surrounding the building play out as a microcosm of Buffalo’s past. While post-Civil War America boomed economically, the nation’s switch from guns to plowshares pushed people farther westward. Buffalo served as a gateway to the western frontier in its role as a hub for rail transportation and inland shipping. This is when Buffalo experienced its greatest growth spurt: the population grew from 150,000 people in 1880 to 350,000 by 1900, making Buffalo (for a very short time) the eighth-largest metropolis in the United States. By 1890 Americans had effectively populated the West to the point that the US Census Bureau could no longer draw a frontier border on a map. Interestingly, the 1890 census was calculated by what is considered the first computer, invented by Buffalo native Herman Hollerith. The company he founded is known today as IBM. At Chicago’s World Colombian Exposition of 1893, which was supposed to celebrate the 400th anniversary of Columbus’ voyage, historian Frederick Jackson Turner declared the frontier closed. Downtown Buffalo rebuilt itself as a commercial and financial center during this period. Residential neighborhoods shifted to the area’s outskirts, creating what is now considered a modern American cityscape. 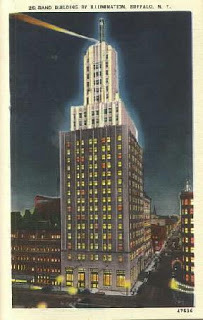 Many of our most famous downtown buildings, including the Ellicott Square building (by Chicago’s D. H. Burnham & Co., involved in building the Chicago Exposition), the Guaranty Building (by the Chicago firm of Dankmar Adler and Louis Sullivan), and the gold-domed Buffalo Savings Bank (by the local firm of Green and Wicks) were erected between the 1890 census and the Pan-Am year of 1901. The Market Arcade, known for a while as the Palace Arcade, was designed by Green and Wicks in 1892. At one entrance, Main Street was a bustling business district of Civil War-era structures with numerous small storefronts. At the other, Washington Street bordered the busy Chippewa Market (also known as the Washington Market). Though a parking lot today, the open-air farmers’ market accommodated dozens of stands and hundreds of urban customers at a time. 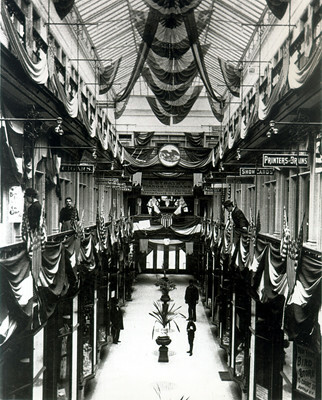 The largest retail market west of the Hudson River, it was known as the “Belly of Buffalo.” Much like Buffalo was a gateway between the eastern and western halves of America, the Market Arcade was a pass-through for local commercial traffic on these two streets. 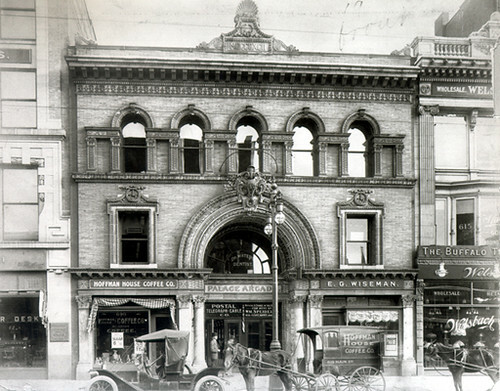 Instead of looking toward Chicago for ideas, however, property owner and oil tycoon GB Marshall asked architects EB Green and WS Wicks to contemplate European arcades. Though built before 1820, the Burlington Arcade in London resembles a modern shopping center. With its bright but narrow interior and floor-to-ceiling windows for shops on both sides, the Burlington Arcade connects Burlington Gardens to Picadilly and bears a striking resemblance to Green and Wicks’ building in Buffalo. Indeed, the Market Arcade is Buffalo’s first mall. The multi-leveled convergences of commerce and office space were similarly used in Naples, Italy for the Galleria Umberto I, completed just one year earlier. The Market Arcade’s floor is covered in terrazzo tiles and the exterior composed of yellow Roman brick, which is longer than regular bricks and emphasizes horizontality. Frank Lloyd Wright utilized this quality of Roman brick when building the Darwin Martin House and other Prairie Style homes. Large Roman numerals top the building’s identical facades. Corinthian Vermont marble pillars at both entrances and egg and dart molding also demonstrate Italian Renaissance Revival flourishes. Some of the best features of the Market Arcade are both practical and aesthetic. Built before electric lighting, the frosted glass skylight makes the atrium seem like an outdoor alley. Overpasses on the second and third levels and sections of the floors encase glass blocks, bringing natural light all the way into the basement. 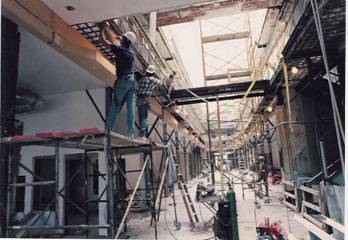 Large glass panes, rare at the time of construction, are perfect for window shopping. The long, straight passageway resembles a tiny street but also provides excellent ventilation in summer without the use of air conditioning. Green and Wicks’ use of terra cotta is probably the most stunning feature of the Market Arcade. Visitors are greeted by two bison heads located above the Roman arches. They keep watch over Main and Washington streets and are detailed to the last hair. While seemingly extravagant today, terra cotta (Latin for “baked earth”) was originally a cheap substitute for carved sculpture. 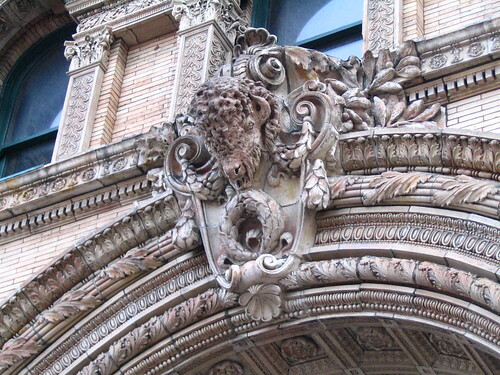 The terra cotta forms of the Market Arcade—the garlands, crowning acroteria, and rosettes—can be replaced at a cost 80 percent cheaper than stone. The material is also fireproof, an important selling point for storekeepers in the late 19th century. Between the formation of the modern Buffalo Fire Department in 1880 and the Pan-American Exposition of 1901, eighteen firefighters died in the line of duty. Entire city blocks would burn at a time. One of the most famous city fires occurred on Ascension Day, 1888. A gas line ignited, blowing the roof off of St. Paul’s Episcopal Church and setting small fires throughout the city. Today, many skyscrapers still enclose their steel beams in terra cotta to avoid buckling under intense heat. By the 1970s the Chippewa Market had long closed down (though yesterday’s Buffalo News suggests it is still open) and Main Streets across America lost customers to suburban strip malls. 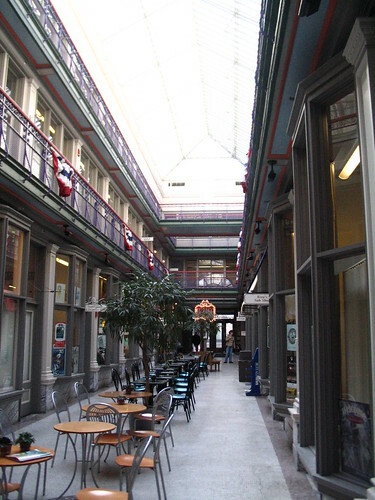 Business in the Arcade followed suit and the building was shuttered; the city acquired it in a bankruptcy proceeding in 1979. By the mid-1980s, enough interest led to an $8.3 million restoration. One of the leaders of this renovation, Dennis Powers, is memorialized on a plaque next to the building’s new elevators. The Allentown-based firm of Hamilton Houston Lownie, which converted the St. Mary of Sorrows Roman Catholic Church to the King Urban Life Center at about the same time, completed the restoration in 1995. Visiting both landmarks, one can see the vibrant splashes of reds, purples, greens and oranges that became the firm’s calling card. Today, the building boasts the CEPA Gallery and the headquarters of Shakespeare in Delaware Park, as well as several small businesses. Many visitors still freely walk through this impressive building to access the Metro Rail or catch shows at Shea’s Performing Arts Center or the Irish Classical Theatre. *Official documents pertaining to the designation of the Theater District as a historic district use the -er spelling for “theater.” However, area theaters now market the overlapping entertainment district known as the Theatre District using -re. For more background, check out this very interesting Artvoice article by Anthony Chase. When I saw fire trucks roll down the street the other day I could tell the emergency was somewhere close, but it was a shame to find out what burned. Seeing the this photo in The Buffalo News made me cringe. 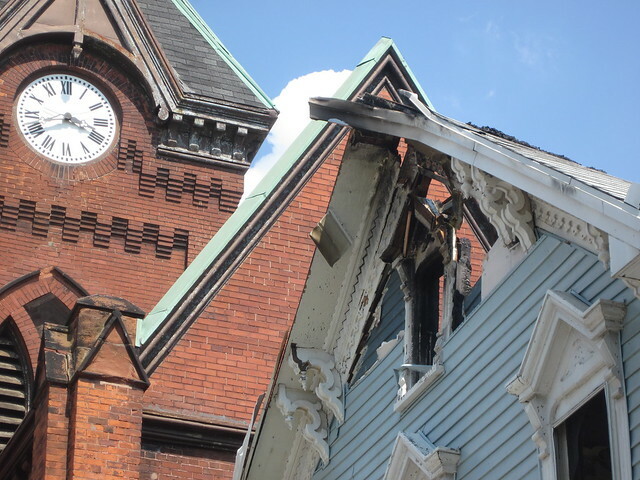 What caught fire was the John Esser House, an Italianate home built circa 1887. You can see the intricate jigsaw work on the gable and fenestration. Fire also exposed the original clapboard hidden away by vinyl siding. Below is what it looked like before. If it hasn’t happened already, it is scheduled for an emergency demolition. 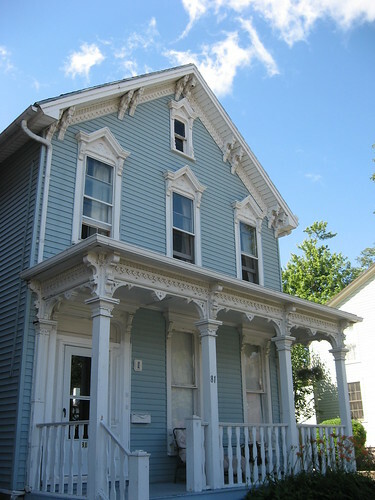 John Esser House, 81 Amherst Street, in a photo from several years ago. The building is/was located in an especially historic part of an historic neighborhood. Just half a block away at Market Square are new plaques commemorating the 200th anniversary of the Burning of Black Rock during the War of 1812. The building to the east is St. John’s United Church of Christ, a congregation founded by German immigrants back in 1847. (Coincidentally, the church sanctuary caught fire in the 1970s.) To the west is the Jacob Smith House and Tavern, dating back to the 1830s. Across the street is what used to be the St. Francis Xavier Church and School, now known as the Buffalo Religious Arts Center. I highly recommend touring their museum. And just two doors away, somewhat ironically, sits the former Engine #15 Firehouse. It was built in 1912 but closed decades ago. Converted into an apartment, for a time the building was the residence of the famous poet Robert Creeley. Pardon the pun, but John Esser had a banner year in 1887. At the time he built this home he was Erie County Treasurer as well as President of the Black Rock Business Men’s Association. That same year, H. C. Zimmerman sold out to his partners Esser, Frederick Ogden, and Henry Shuttleworth of the Banner Milling Company, who expanded their operations by buying the Erie Mill. A few months later he would create the Black Rock Land Company, the first development company in the area. Esser Ave., Angus St., Roesch Ave., and Ullman St. in Riverside are named after him and his Land Co. investors, with the exception of John Hertel. Luckily no one was hurt and fire did not spread to any neighbors. I feel bad for the people displaced by the blaze and would rather not post more photos of their misery. When I visited a few hours ago the roof was completely gone, the entire back of the building charred, and the smell of smoke still hanging in the air. But the demolition of this home does seem to erase the deep imprint the Esser name left on Black Rock. The aforementioned St. Xavier’s, closed several years ago, featured an ornately carved, wooden lectern dedicated by the Esser family. (Note: I have not confirmed any direct connection to John Esser himself.) Very recently, the Key Bank at the corner of Amherst and Dearborn moved out. That building can trace its history back to the Black Rock Savings & Loan, founded in 1892 by–you guessed it–the Black Rock Business Men’s Association. 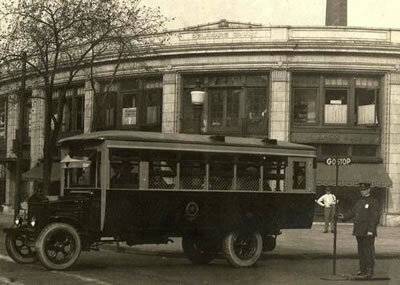 The corner of Amherst and Dearborn Streets circa 2012 and 1912, respectively. This building was constructed in the 1870s. The 2012 photo is from BuffaloAH.com. Within four blocks you had the Erie Canal, a mill, a tavern, two churches, a school, a market, and a locally supported bank that funded it all. John Esser had his hand in much of that. 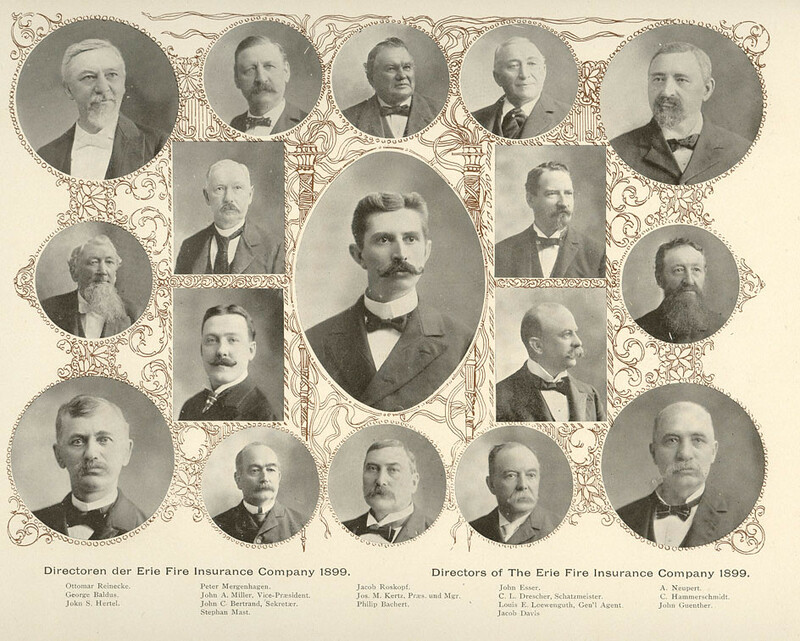 Here’s another sad irony: a photo of John Esser as a director of the Erie Fire Insurance Company. 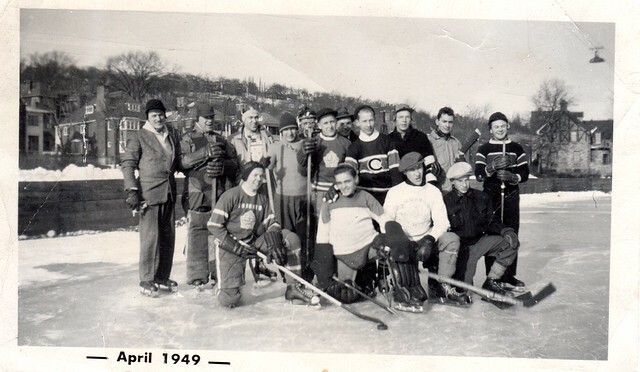 He is at the top row, second from right. Click for a larger version. Taken from The History of the Germans in Buffalo and Erie County, N.Y. by way of Archivaria.com.